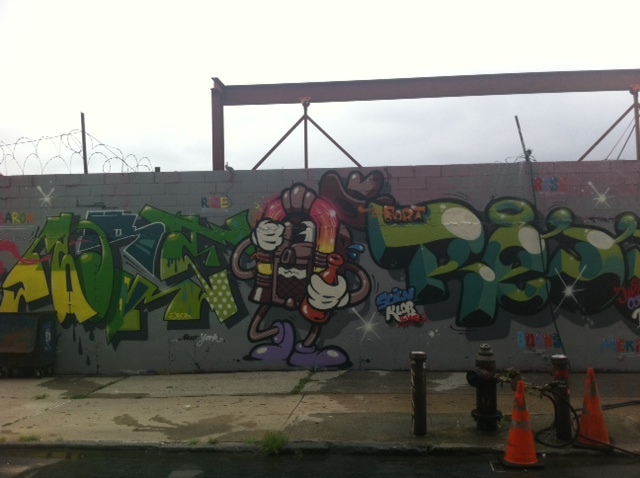 Dekalb Market and Bushwick munching – Can I pay for this free pizza?? 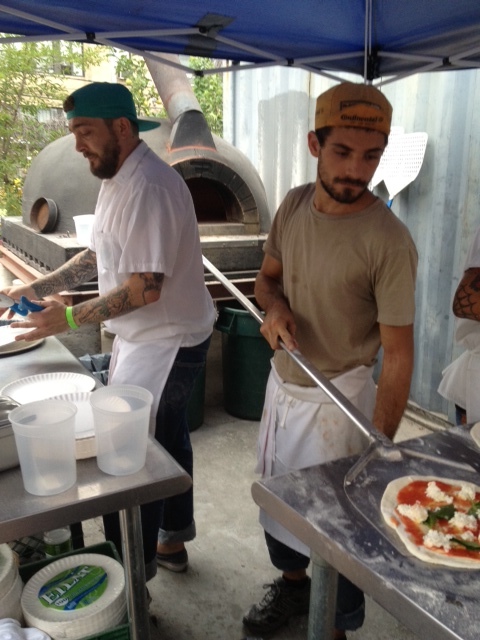 The super popular Roberta’s happen to host the annual Bushwick block party yesterday. As soon as we entered we saw a huge line for free Roberta’s pies and I really hate lines unless food is involved. Sometimes I see a line and I just get on it and ask questions later. “DMV? oh look at the time, I’ll come back some other time”. But we decided to come back later and check out some of the other vendors first in an area I can best describe as the graffiti and tattoo capital of the world . Started with a familiar face, Furn Shawarma. I’m not big into Chicken Shawarmas as I prefer meat but this was pretty darn good. Perhaps even better than Mamouns in the village. This was a nice piece of art. Yogurt marinated, beautifully spiced goodness with various veggies and a nice sauce. First and best thing I ate all day. Then I took it easy with some healthy Ethiopian from Bunna Cafe. Tried the Gomen, steamed kale with other veggies and spices, Yellow split pea salad, and the more satisfying split red lentils with spicy barbere. But the best part may be the spongy, smooth, flat Injera bread they serve with it. Finally I had a chance to try the touted Arancini (rice balls) from the Arancini Bros. Tried the Ragu and the Norma. Nicely done! Could have used a bit more of the non-rice goodies inside, a bit of a tease, but tasty nonetheless. 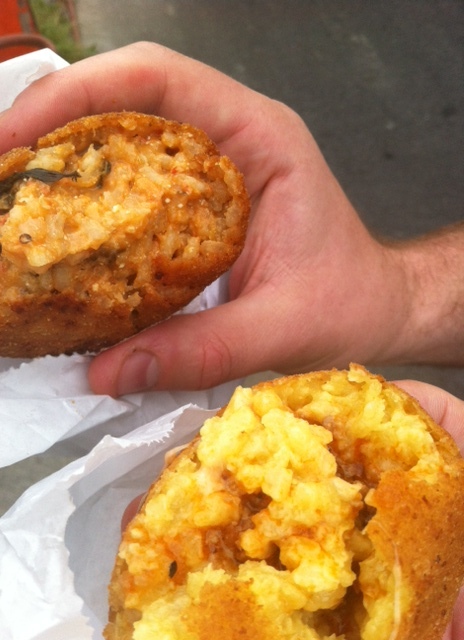 I think I got spoiled by the Jambalaya rice balls of Staten Island’s Bayou. Then we finally decided to get our free pizzas and fufill a dream. Got on line, stood for a few minutes until we were told its past 2 pm so no more free pizzas but we could go to the bar area and pay for our pizzas which I did. But with all the chaos with the people on line continuing to snag all the free pies, they said it may take a while to get ours so I just got my money back. Hey I’m trying to pay for this free stuff and I still cant get it!! And after we realized that waiting for a table inside Roberta’s will require an hour wait, reality struck. Sorry man, we are not getting Roberta’s today!! Moving on to the Dekalb Market. 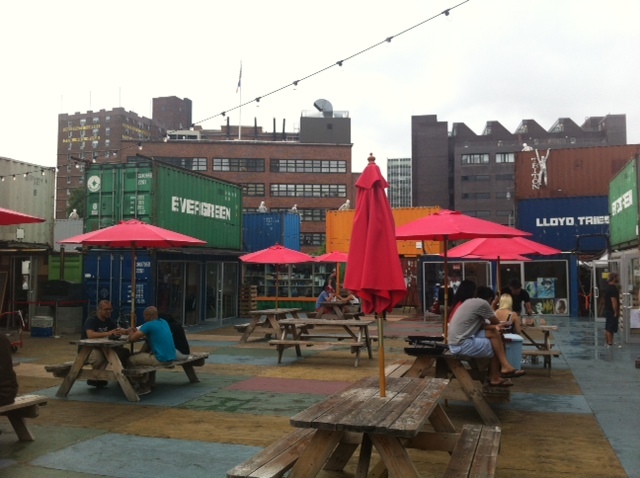 A market in the middle of the hustle and bustle of downtown Brooklyn with stores peeping out of shipping containers. Just in time for some Brazilian band performing with all kinds of technical issues including some weird Depeche Mode rendition. After surveying the impressive food array with the little appetite I had left I started with some grilled Filipino Longanisa sausage from Maharlika. Very sweet sausage, almost like sweet potatoe but tasty nonetheless especially once you add some of their spicy vinegar. Comes with nice aromatic garlic rice. Before that I tried the Korean Taco from Oaxaca. Feh! dry, probably seating there for a while meat swimming in red sauce. The clunker of the day. The HW meanwhile was busy drowning his sorrows with a double dose of Centruy frozen yogurt. Time to head back to our families. As the HW put a reminder on his iphone for the next Bushwick block party, I noticed a tear. A tear made of hummus!